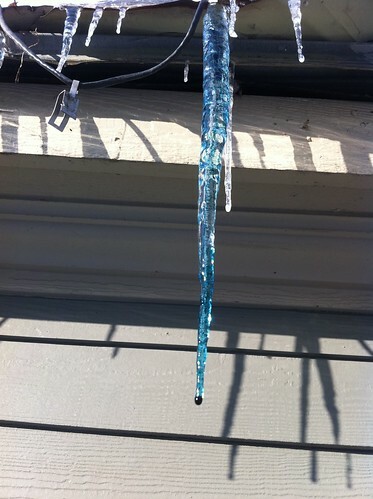 Last week I posted some pictures of colored icicles. Since then I have become very interested in icicles as features of 'micro-watersheds' - areas where snowmelt, rain, and other precipitation run off of impervious surfaces like rooftops. To get people thinking about icicles and how water moves through them and their surrounding urban landscapes, I've been putting food-coloring dye on icicles in prominent places in Middlebury, Vermont and Burlington, Vermont. The results are striking in some cases, and illustrate just how quickly water can actually move through these seemingly static formations. Vermont is locked in a deep freeze, with most areas falling somewhere between -15 and -30 last night. I tried a couple of experiments in the cold air, mostly from inside via a quickly opened then shut door. It's COLD out there! If you toss boiling water into subzero air, it turns into snow/steam immediately! Very little touches the ground - if it were even colder the entirety of the water would evaporate or turn to snow in midair. Not the best video, but you get the idea. Ever wonder what happens to soap bubbles when it is really cold? Maybe not, but I did. I blew some bubbles out the door and they quickly gained a very 'plasticy' texture. These bubbles don't disappear if they pop, instead they slowly deflate or even retain their form. A few popped in midair and spiraled downward like crashing blimps. Very neat! More to follow, including colorful icicles. The coldest weather in at least a couple of years is heading for Vermont. Temperatures (Farenheit) this weekend are going to range from single digit highs to lows near -20. This is not terribly unusual for Vermont; it happens every now and then and used to happen more often. I've never been in temperatures this cold, though. I really want to try tossing boiling water outside in subzero temperatures, so if it gets cold enough, I'll give that a try. I also need to fill up my gas tank, apparently that makes it easier to start your car when it's cold and I do need to drive on Monday morning. 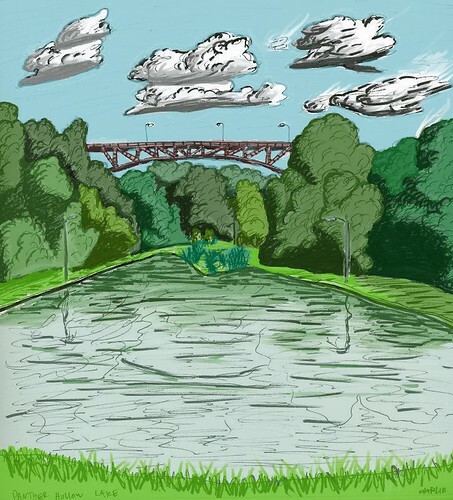 When I was in Pittsburgh last week I made a few more sketches. The January Thaw has come and gone, and now seems like a distant memory as the northeastern United States moves into one of the most notorious of its many seasons: midwinter. While this Vermont winter isn't particularly unusual in its harshness, it IS significantly colder than last winter was. Pittsburgh has been experiencing more unusual cold, as mentioned before. In the last few weeks, Australia has been hit with downright apocalyptic floods. Entire cities have been flooded, normally-dry creeks have risen to shocking levels, and tragic loss of life has occurred. To most of the people who read this blog, Australia is a far away place. The floods are shocking and upsetting, but they are occurring in a place that is very different than the one we are familiar with. The uncomfortable truth, however, is that such storms CAN happen in the United States as well. In fact, that similar floods have happened in the not-that-distant past - as close to home as California. In 1862, a series of intense storms turned the entire Central Valley into a lake, and entire cities were wiped off the map. Geologic evidence indicates that EVEN STRONGER storms have happened since the last ice age. And, a warming climate could make future storms of this sort more frequent than they have been in the past. Above: this remote ridge in California's Los Padres National Forest is called Hurricane Deck for a reason. The Transverse Range of southern California does a very good job of blocking and amplifying storms that approach from the south, and in extreme conditions, areas of these mountains have been known to get over 20 inches of rain in a DAY. Note: I apparently misspelled this as 'ARcSTORM which is, I guess, some sort of GIS program. The correct spelling is ARkSTORM. A lot of people have been finding this blog page because they made the same spelling mistake as I did. Please see this USGS site for info on a project to raise awareness and increase preparation for such a storm system. Click below for more info and thoughts on the potential for major flooding in California. The following incredible YouTube video has been making the rounds on the internet. It shows a flash flood quickly raising in level and tossing cars like plastic toys. There has been a lot of talk about the influence climate change may have had on this flood. I haven't heard much talk about how watershed conditions may have made the flood worse as well. So, I pulled up a map of this creek. Click below to see what I found. In the January Thaw post I made a couple of weeks ago, I mentioned that Pittsburgh isn't usually below freezing for many weeks at a time without a thaw. It's been a COLD winter here, though, and this winter there really haven't been a lot of thaws. This morning the lows were in the teens (Fahrenheit) and the highs were in the mid to upper 20s. This is the city I drove into last night, and the city I drove out of last August was muggy and hot. The change is quite dramatic! Today I bundled up and explored Panther Hollow in the cold. Los Angeles is bounded to its north by large, steep mountains. They are some of the fastest rising mountains on Earth, as described by John McPhee in The Control of Nature. Add to this equation crumbly rocks and potentially torrential winter rains. What do you get? Millions and millions of tons of debris washed out of the mountains after every storm. When you drive north from downtown Los Angeles, you head upward, slowly. 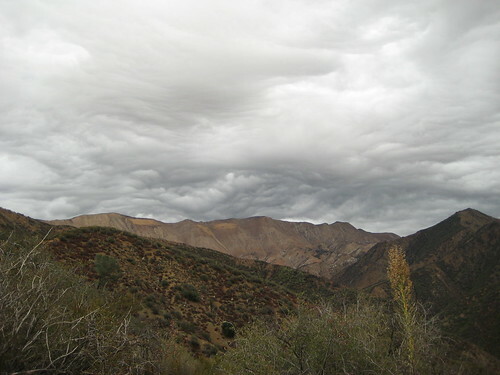 Much of what you are ascending is the alluvial fans comprised of debris from the San Gabriel Mountains. I've heard it said that the debris is piled miles deep at the base of these young mountains. Large washes, as seen in this map from 1880, traversed the valleys, and filled with water and debris during storms. When the city and its sprawling suburbs were built, there was no room for wandering washes. Fredrick Law Olmstead, the creator of Central Park, recommended leaving wide spaces for the rivers to wander through during floods. The rest of the time, they would act as parks and open spaces. But, instead, the washes were put into concrete ditches. The concrete ditches couldn't handle the debris and rock from the mountains, so a series of debris basins was constructed to trap it all. A large, steep, tectonically unstable mountain range sheds a lot of sediment. 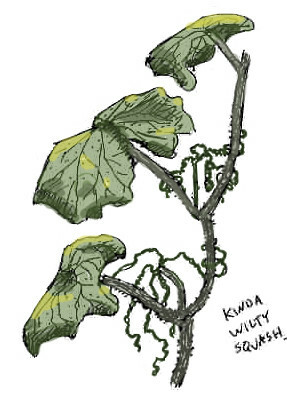 It doesn't help the situation, either, when the deep-rooted vegetation is replaced by shallow-rooted invasive weeds, when the fire frequency is greatly increased, or when poorly-designed roads and firebreaks slash across the hillsides and cliffs. The rate of erosion is increasing, the debris basins keep filling up, and someone has to find something to do with all that debris! It's a tough call. There are lots of old gravel quarries nearby (some people apparently WANT debris since that is what the quarries are digging up) and landfills often need fill material as well. But, residents in the area don't want to listen to trucks driving by, carrying all the debris (even though doing this is the only reason they can continue to live there). So instead, it is all getting dumped on 11 acres of now-rare alluvial oak woodland next week. I really don't believe that people couldn't have found a better option than that. Stories like this make me glad I left California. It was just too heartbreaking to watch so much of what I cared about and loved being destroyed. It still is, even from afar. 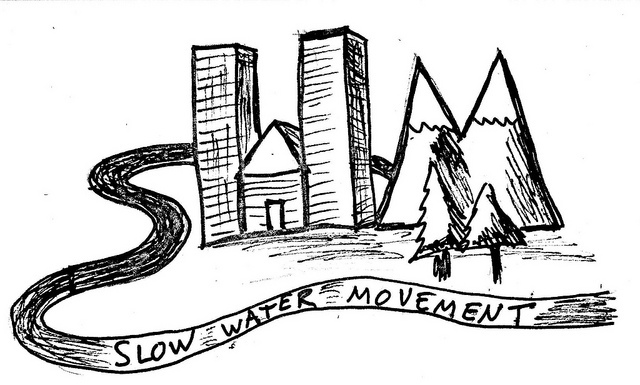 I'm going to be heading out to Pittsburgh next week to meet with some good people and see what the Four Mile Run watershed is like in the middle of winter. It should be a great trip, and I expect the area to seem VERY different than when I left the city amidst muggy, 90 degree days. In preparation for my trip, I am going through a bunch of old files and photos, and I found some art I created over the summer. Some of them were later modified in Photoshop or other graphical editing software, and it should be pretty obvious which those were. In cold climates like Vermont, it isn't uncommon for the temperature to stay below freezing for weeks, or even months. This year, the second half of December was marked by at least two weeks with below-freezing high temperatures and occasional snowfall. The area developed a significant snowpack, and most ponds and lakes (except Lake Champlain) froze over. Most years, however, the long periods of cold are broken by at least one (sometimes several) short periods of significant warming. Some love these short periods because they offer a break from the cold. Others grumble angrily because they tend to remove all of the snow (and are ruinous for skiing). Like it or not, it's a near certainty most years in Vermont. 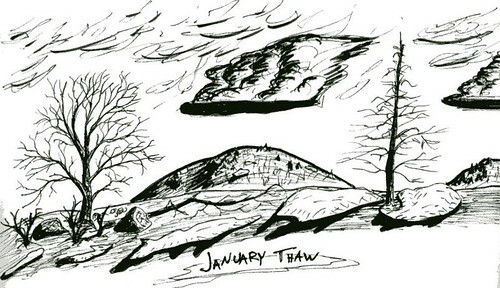 It even has a name: the January Thaw.